A mysterious medieval wall painting found beneath the floor of the Bishop of Bath and Wells' bedroom has given up its secrets. 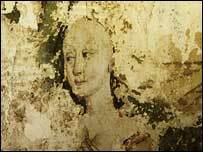 The painting was found by builders three years ago in the space between two floors in the Virgin's Tower next to heating pipes where the whitewash had fallen away. Dr Horton said: "The amazing thing is that this medieval manuscript accurately records what was on the wall. This included details of foliage and fruits which we then were able to find behind the heating pipes next to the image of the lady. "It was rather like something out of the Da Vinci Code, creeping beneath the bishop's floorboards to come face to face with this incredible piece of medieval art." The discovery has inspired the current Bishop, the Right Rev Peter Price, who lives in the palace, to want to restore the throne room to its former glory with the painted lady in pride of place along with the rest of the earthly garden.